ATLANTA - March 14, 2019 - PRLog -- First, off...there's a bevy of reasons why, but let's start with the most obvious. There's not a sinister plan to mislead or dupe men into thinking we have something we don't. Although the lace-front wigs of today are nothing short of witchcraft (but that's what women love about it). If you get the right density and fit, it can look like it's your hair by birthright! Yes, our natural hair looks great and has non-stop versatility. However, it's not without its challenges. Keeping adequate moisture and having to look at the calendar a week before we get it blowed-out and flat ironed (you know...cause it might rain). That could be catastrophic and the loss of a good $75 bucks or more. Beyond that, the colors, lengths and textures that make the glamour girl in us giggle with glee, isn't always realistic or possible with our particular brand of genetics. For some women of color, any type of high temperatures and/or chemical stress will result in hair fall. So, in comes the weaves, the wigs, the crochets and the braids! You can get what you want without sacrificing what you have! Be it by means of synthetic or human hair, and if a beautifully quaffed horse is near throwing his hair around, he'll get snatched too! It's funny but horses have fascinatingly gorgeous hair. I digressed, let's move on. "THE NEED"
There's no denying that rampant environmental issues, high ticking cases of poor diet, low hair maintenance and growing diseases. These instances have elevated year after year and have taken a toll on the weakest inhabitants on our bodies...our hair. There are so many factors that can cause hair fall and several more that will arrest hair from ever growing back. Depending on your initial health, Cancer is the biggie. Then there are thyroid disorders, Alopecia, Candida (Fungus). Lastly, diet and lack of vitamins that provide nutrients to enable healthy hair and dependable hair growth. 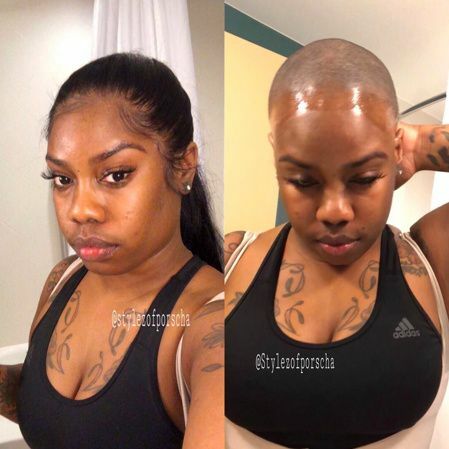 We have seen unprecedented cases of black women and girls are going bald. More than ever before. And it's really hard to talk about and exists on a level playing field with those who are blessed NOT to have these concerns. Unfortunately, we are our own worse enemies. It's nearly impossible to get on social media and not be pelted with our black men and women attacking those who want to or have to wear false hair. The infamous taunt of "Real hair, don't care" hurts those who need it or feel more empowered by wearing it. Men mocking women and challenging them to bare their real selves in order to be considered in the dating pool. We get it, you want to know who you're really are falling in love with! You don't want to be in the next installment of "I'm gonna get you sucka!" That's a very valid point. However, that can't be done by bullying someone about a subject that hurts them, more than it will ever hurt you. What woman prefers to be bald or have male pattern baldness??? I can't think of one, at all. This is especially confusing when men glorify women that portrays to have a sea of flowing hair, that they can damn near wear as a coat! Finally, let's finish with "THE CHOICE". Not the choice to wear or not to wear. The choice of what (we as women) buy and glue to our heads. I think much of the complaints stem from the quality of hair that we choose to buy and the methods in which we put them on. The facts are, a lot of us don't know how to shop for wigs and weaves and don't know how to trim the lace properly and then we don't know how to glue them down and keep them clean. And the greatest offender of them all is the "Ill-fitted" wigs and weaves. For starters, you have to spend some quality time looking at these units. If you buy online, choose a unit and get the stock number. Then go to YouTube and put the name and stock number of that wig in. They're plenty of reviews by women who have purchased (or been given) that same wig. Watch the review. She will show it to you fresh out of the package. She will let you view it inside and out, and then she'll put it on and style it. Some times. I'll even go so far as to find a girl that looks similar to me. If it looks good on her, then I may buy it. If you don't have that kind of (deep dive) time. Just go to your local Beauty Supply Store and look at some units. Take them off the mannequin's head, and ask to try it on. If you don't want to do that, here's a quick cheat method. Put the back of your hand inside it (under the netting of the scalp), if its full of large black dots from where they plugged the hair in, then it's going to look like doll hair on you. Small or camouflaged knots are the way to go whether synthetic or human hair. Unfortunately, this article is not going to cover all of the nuances that will give you a great quality look while wearing units, but hopefully, it's a start! My suggestion is to get with a professional or become an internet skilled professional by watching online tutorials. In parting, I would like to say, whatever you're doing or whatever you want to do, do it with class because there's always somebody watching, waiting and posting. Stay tuned for more articles like this. Stravard Lux Publishing House Inc. BREAKING NEWS...Yvette Kendall and "The GOD Maps" is here and sci-fi will never be the same!